“In the book Human Emotions, author Carroll Ellis Izard says “a complete definition of emotion must take into account all three of these aspects or components: (a) the experience or conscious feeling of emotion, (b) the processes that occur in the brain and nervous system, and (c) the observable expressive patterns of emotion, particularly those on the face” (p. 4). This third component is where oculesics plays a role in nonverbal communication of emotion. Oculesics is a primary form of communicating emotion. The study of Neurolinguistic Programming (NLP) establishes three main types of thinking: in terms of what you see, hear or feel. According to this science, oculesics can show which type of thinking someone is using when they are communicating. A person thinking visually might physically turn their eyes away, as if to look at an imagined presentation of what they are thinking, even to the point of changing the focus of their eyes. Someone thinking in terms of hearing might turn their eyes as much as possible to one of their ears. A person thinking in terms of what they feel could look downwards, as if looking toward their emotion coming from their body. There are many theories on how to annotate a specific list of emotions. Two prominent methodologies come from Dr. Paul Ekman and Dr. Robert Plutchik (both professors are referenced above as well). Dr. Ekman states there are 15 basic emotions- amusement, anger, contempt, contentment, disgust, embarrassment, excitement, fear, guilt, pride in achievement, relief, sadness/distress, satisfaction, sensory pleasure, and shame- with each of these fifteen stemming out to similar and related sub-emotions. Dr. Plutchik says there are eight basic emotions which have eight opposite emotions, all of which create human feelings (which also have opposites). 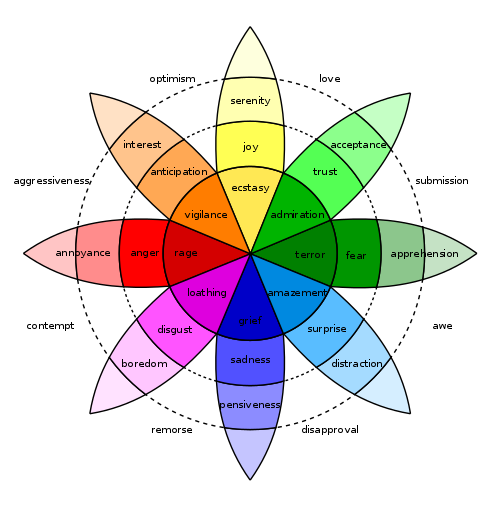 He created Plutchik’s Wheel of Emotions to demonstrate this theory. Perceptions and displays of emotions vary across time and culture. Some theorists say that even with these differences, there can be generally accepted “truths” about oculesics, such as the theory that constant eye contact between two people is physically and mentally uncomfortable. Eyes up – Different people look up for different reasons. Some look up when they are thinking. Others perform that action in an effort to recall something from their memory. It may also be a way for people to subconsciously display boredom. The head position can also come into play, however, as an upwards look with a lowered head can be a coy, suggestive action. Eyes down – Avoiding eye contact, or looking down, can be a sign of submission or fear. It may also indicate that someone feels guilt. However, depending on the culture of the person, it may also just be a sign of respect. Lateral movement of eyes – Looking away from the person to whom one is speaking could be a sign that something else has taken their interest. It may also mean that a person is easily distracted. Looking to the left can mean that a person is trying to remember sound, while the right can mean that the person is actually imagining the sound. Side to side movement, however, can indicate that a person is lying. Glancing – Glancing can show a person’s true desires. For instance, glancing at a door might mean that someone wants to leave. Glancing at a glass of water might mean that a person is thirsty. Eye contact – Eye contact is powerful and shows sincere interest if it is unbroken. A softening of the stare can indicate sexual desire. Breaking that eye contact can be threatening to the person who does not break the eye contact. Staring – Staring is more than just eye contact, it usually involves eyes wider than normal. A lack of blinking may indicate more interest, but it also may indicate a stronger feeling than a person may intend to portray. Prolonged eye contact can be aggressive, affectionate, or deceptive. Following with the eyes – Eyes follow movement naturally. If a person is interested in someone, then their eyes will follow that person naturally. Squinting – Squinting of the eyes may mean a person is trying to obtain a closer look. It may also mean that a person is considering whether something is true or not. Liars may use squinting as a tool to keep others from detecting their dishonesty. Of course, squinting may also just be a result of a bright sun. Blinking – Blinking is also a natural response that can occur for no other reason than having dry eyes. It can also be the result of a person feeling greater levels of stress. Rapid blinking can indicate arrogance while reduced blinking can move towards a stare. Winking – Winking can indicate that two people understand something without using words. It can mean “hello” or it can be a sign of flirtation. Closing of eyes – Closing the eyes serves to shut out the world. It can be a reaction to fear or embarrassment. Others may close their eyes as a way to think more sincerely about a particular subject. Eye moisture – Tears obviously indicate sadness, but moisture also has a more practical purpose to wash and clean the eyes. Damp eyes can be suppressed crying or an expression of extreme happiness or laughter. Men, in many cultures, are not expected to cry but may experience damp eyes in place of crying. Pupil dilation – Pupil dilation may be harder to detect by most people. Sexual desire may be a cause of such dilation. It may also be an indication of attraction. Physiologically, eyes dilate when it is darker to let in more light. Rubbing of eyes – Eyes may water, causing a person to rub their own eyes. This can happen when a person feels uncomfortable or tired. It may also happen when a person simply has something in their eyes. In his essay The Coordinated Management of Meaning (CMM), Dr. W.Barnett Pearce discusses how people derive meaning in communication based on reference points gained or passed down to them culturally. Winston Bremback said, “To know another’s language and not his culture is a good way to make a fluent fool of one’s self.” Culture in this sense, includes all of the nonverbal communication, customs, thought, speech and artifacts that make a group of people unique. Brembeck knew of the significant role that communication plays besides language. While most of the nonverbal communication is conveyed subconsciously, there are cultural similarities that enable us to understand the difference between what is being said and what is actually meant. But generalizing between nonverbal communication between cultures can be tricky since there are as many cultural differences in nonverbal communication as there are languages in the world. While it may take a child a couple of years to speak understandably in a certain language, it is important to remember that the child is also learning the idiosyncrasies of nonverbal communication at the same time. In fact, the first couple of years of a child’s life are spent learning most of these nonverbals. The differences between cultures are thus ingrained at the very earliest points of development. Anthropologists have proven for years that nonverbal communication styles vary by culture. Most people, however, are not only oblivious to the differences in these nonverbal communication styles within their own culture, but they also assume that individuals from other cultures also communicate in the same way that they do. This is a phenomenon called projected similarity. The result of projected similarity is that misperceptions, misinterpretations, and misunderstandings occur in cross-cultural interactions when a person interprets another’s non- verbal communication in the light of his or her own cultural norms. While all nonverbal communication differs greatly among cultures, perhaps none is so obviously different as the movement and study of eye contact. A particular nonverbal interaction between two individuals can have completely different meaning in different cultures. Even within that same culture, oculesics plays a tremendous role in obtaining meaning from other nonverbal cues. This is why, even among the same culture, humans still have trouble sometimes understanding each other because of their varying eye behavior, nonverbal cues, and cultural and personal differences. It is because of these personal differences, that in studying cultural communication patterns we sometimes find it necessary to speak in stereotypes and generalizations. Just as one might say that Puerto Ricans who speak Spanish tend to use a louder voice than others communicating at the same distance, it would not be fair to say that all Puerto Ricans exhibit the same qualities. There are obviously enormous variations within each culture. These variations can depend on age, gender, geographical location, race, socioeconomic status, and personality. Because there are so many factors to study, most are generally glossed over in favor of stereotypes and generalizations. “Let’s put aside loving your job or a piece of clothing in which the use of the word “love” is as a superlative. That still leaves romantic love and parental love: Are either of these emotions? I think not and here’s why-the time frame for emotions and love are radically different. Emotions sometime last as little as a few seconds, rarely more than an hour. Emotions come and go. If we recollect that we were mad for an hour or afraid for an hour close examination reveals that actually we felt that emotion a number of times within the hour, it wasn’t one continuous emotional episode.